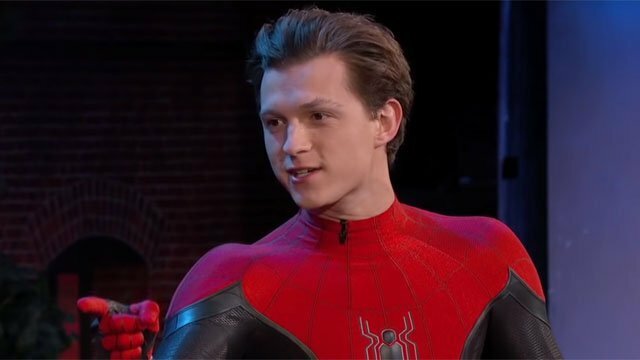 Earlier this week, Tom Holland shared the news that Spider-Man: Far From Home has wrapped principal photography. In the last few months, pictures taken on the set showed fans a glimpse of the new Spidey suit Holland will wear in the film. Perhaps that’s why Holland went on Jimmy Kimmel Live! to officially debut his latest Spider-Man costume. It’s not as tech heavy as the Iron Spider costume he wore in Avengers: Infinity War and his chest logo looks more like a Wi-Fi signal than a spider. But it’s still largely faithful to Spidey’s comic book costume, even though it favors red and black over the traditional Spider-Man red and blue. What do you think about Tom Holland’s new Spider-Man costume? Share your thoughts in the comment section below!